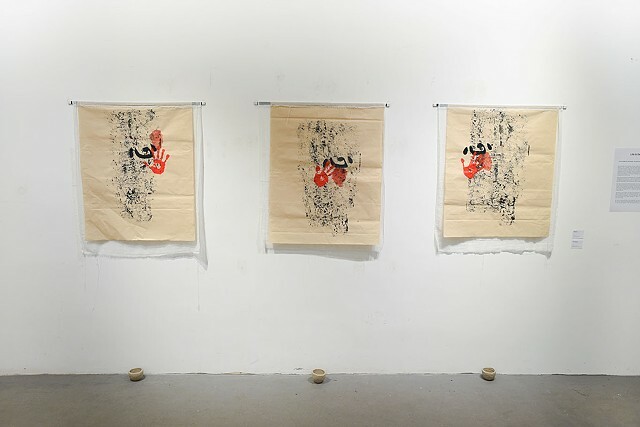 Hearts is a series of mixed media works on paper, using a woodblock that I carved of the Chinese character "heart", printing from two parts of tree trunks, red wax and red thread. The six works symbolize my deceased father, Bay Doc Chiang, my deceased mother, Hop Kun Leo, my deceased sister, Fay Ping Chiang and my deceased brother, Peter Chiang. Included are my very much alive niece, Fay's daughter, Xian Chiang-Waren and myself, Jean Chiang. Six Bowls are unfired clay symbolizing the members of my family. The melted red wax symbolizes blessings and the red thread is life and death viewed from different sides.